Haley's Comic: Hubs is Not Harry Potter. I Think. Hubs is Not Harry Potter. I Think. Since I posted my Harry Potter Abridged series last month, Hubs has brought to my attention that I draw him basically the same way I draw Harry Potter. I guess I can see the resemblance. They are both male, and both have black hair, so since my drawings are not really that detailed, that pretty much makes them identical. However, there are some fundamental differences between Harry Potter and Hubs. 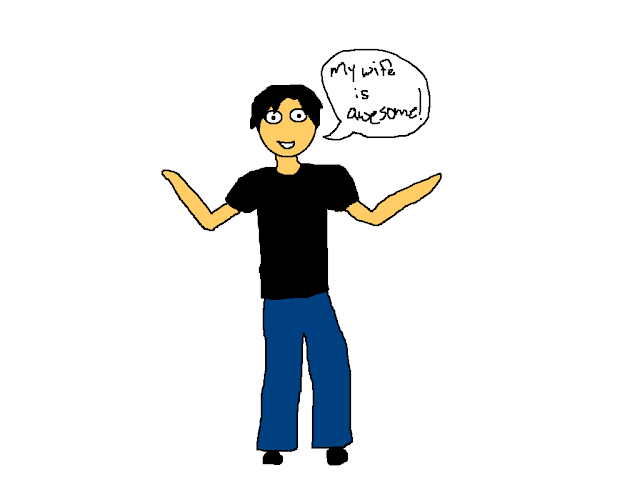 This is how I draw Hubs. 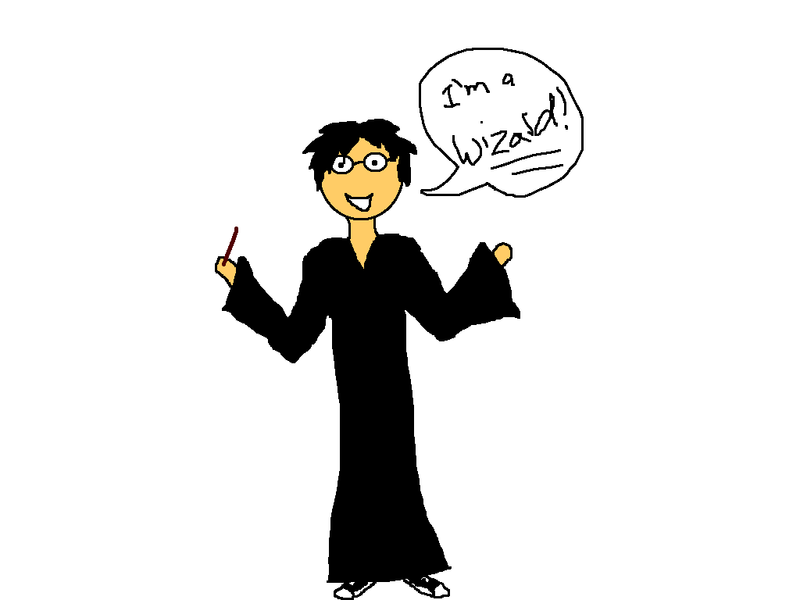 This is how I draw Harry Potter. 1. Harry Potter is wearing wizard's robes. I don't think Hubs owns any wizard's robes. 2. Harry Potter has a wand. I don't think Hubs has one of those, either. 3. Harry Potter is saying he's a wizard, whereas Hubs is proclaiming his undying love for me. I don't think Hubs would ever say he was a wizard because, as established previously, he doesn't own any wizard's robes or a wand. 4. Harry Potter's hair is slightly messier than Hubs'. 5. Harry Potter wears glasses. Hubs actually wears glasses sometimes, but I don't draw him wearing glasses. Because… um… the first time I drew him wearing glasses, I realized it made him look like Harry Potter. For the record, this is what Hubs really looks like. Sheer adorableness. All the time. As you can see, he has a little beard-thing, which further differentiates him from Harry Potter. I don't usually draw him with facial hair, though, because it makes him look sort of… rapey. Actually, the goatee really doesn't look so rapey there, but I don't feel like drawing it on a regular basis. So, to clear things up, my husband does kind of look like Harry Potter, but he's not really Harry Potter. At least, as far as I know. I'll tell him you said that--it will make him very happy.